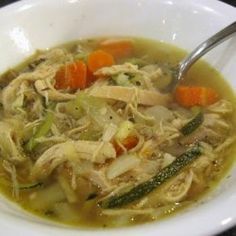 Most people think of chicken noodle soup as the “go-to” meal when you’re feeling sick or under the weather. But this twist on the old recipe provides a healthy dose of daily nutrition and is great for all phases of the Ideal Protein diet. No need to wait until you’re sick to try Chicken & Vegetable Noodle Soup! In a hot non-stick pan with grape seed oil, add peppers, lemon grass, mushrooms, thyme and bay leaf; let cook. Now, add celery and let cook for a minute or two. Then, add chicken stock; bring to a boil. Meanwhile, in a bowl, add zucchini and chicken. Once the chicken stock starts to boil, pour bouillon over zucchini and chicken. Ready to serve! Note: This recipe if great for using leftover chicken!